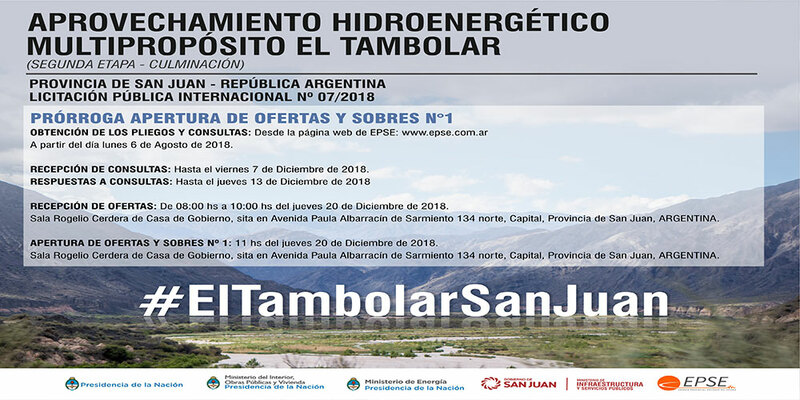 DELAY IN ENVELOPE OPENING OF BIDS N. 1 INQUIRIES AND TERMS AND CONDITIONS: from the EPSE website at www.epse.com.ar as of August 6th, 2018. RESPONSES TO QUESTIONS: Until December 13th, 2018. RECEPTION OF BIDS: From 8 am to 10 am on December 20th, 2018. Rogelio Cerdera room at the Governor’s Mansion at 134 North Paula Albarracin de Sarmiento Road, San Juan Capital, San Juan Province, Argentina. ENVELOPE OPENING OF BIDS N. 1: 11 am on Thursday December 20th, 2018.